A man who laundered money in a business deal with ex-Nigerian dictator General Sani Abacha has been ordered to repay £26.5m by Jersey's Royal Court. Raj Arjandas Bhojwani, from India, laundered £28m through the Jersey branch of the Bank of India. He was jailed in 2010 for eight years, but in February this was cut to six years for Bhojwani's good character. The money was laundered in a business deal with the late Nigerian military dictator, who died in 1998. The Royal Court ordered the confiscation of £26.5m and for Bhojwani to contribute to the prosecution costs. A statement released by the Royal Court said it represented the end of a long investigation into serious money laundering in Jersey. HM Attorney General Timothy Le Cocq, QC, said: "This is not the first time the attorney general has brought a successful prosecution for money laundering and we hope that it will send out a clear message that Jersey will deal very seriously with such offences." 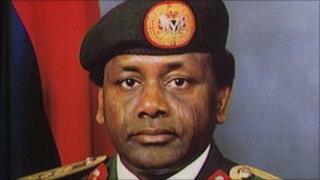 The case began following an investigation into the activities of General Abacha. $170m connected with the Abacha investigation has already been returned to Nigeria from Jersey and it is expected some of the confiscated money from Bhojwani will also be returned.